AO Blog > California Rivers: Flows, News, Events > South Fork American > American River Music Festival September 2014: Raft and Rock Out! 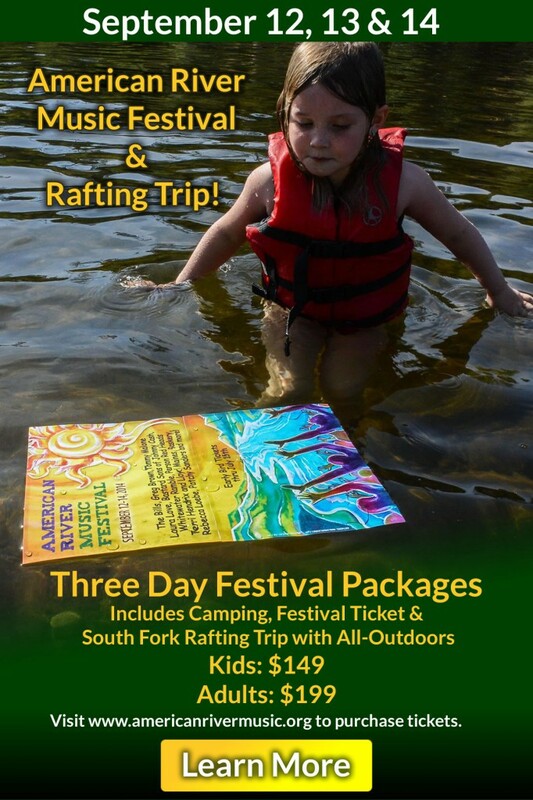 American River Music Festival September 2014: Raft and Rock Out! It’s back! The annual American River Music Festival is back for another awesome weekend of music, camping, and a festival river trip! We’re excited to be partnering with the festival again this year, and will be running a special Upper “Chili Bar” trip on the South Fork of the American River for festival goers. Get this people. A ticket is $199 and gets you: over 30 musical performances, camping, shuttles all around the valley to different venues, and a river trip with AO Rafting! And it’s for THREE DAYS. Ok, only one day of rafting, but three days of festival goodness. For $199. Only $149 for kids. There are 9 venues at this year’s festival, including the campgrounds, so you will literally be surrounded by music all weekend long, whether you’re grabbing coffee at the Bakery, Pizza at Marco’s, or seeing the headliners on the main stage at Henningson Lotus Park. AO Rafting will be your hosts on the festival river trip, but all ticket sales are run through the festival website. Learn more about the musical line-up, the camping options, and book your tickets before they sell out!